We’ve all got our pet hates. Some people can’t abide those who smoke, or perhaps have a particular disdain for anyone that bites their fingernails. With us, it’s people who shout when talking on their phones. With modern phones as wonderful as they are, there really is no need to raise your voice when talking to someone because they can hear you just fine. In fact, by shouting or simply talking too loudly there’s a good chance you’re making the call sound worse at the other end thanks to good old fashioned distortion. Just stop it! Perhaps smoke signals would be more suited to these people. Thankfully we’re not alone in our annoyance. While it’s safe to say that most people don’t want to listen to everyone’s conversations – or at least half of them – comedian Greg Benson has taken to YouTube to start a one-man war with anyone who talks too loudly when on their phones. Benson’s modus operandi is to position himself next to someone who’s being a little too vocal on their phone and then start doing the exact same thing himself. That probably wouldn’t be all that funny on its own, but the kicker is that he actually takes over the role of the person on the other end of the loud talker’s call. During his videos you can watch as people begin to catch on to what he’s doing, with one person even seeing fit to actually run away from him during his little performance. Unfortunately we doubt they learned their lesson in the process. Loud talkers aren’t the only phone-related annoyance either. People using their phones at the dinner table, taking selfies every thirty seconds and just generally being anti-social are some other irritations that have come about thanks to the proliferation of the cellphone. All we can do is highlight it and hope that these people start to realize the error of their ways before we have to start taking their phones off them for their own protection. And that just wouldn’t do now, would it? 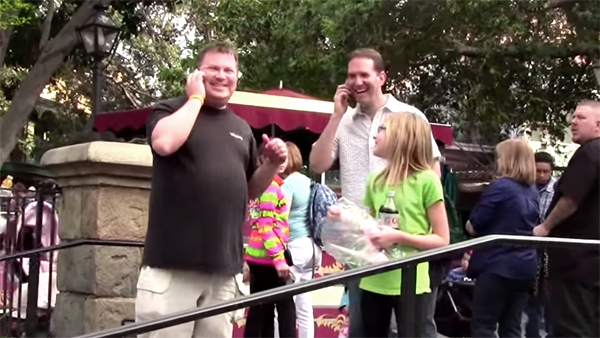 Do you think this is the right way to publicly shame people who talk loud on their phones? Or you have a better solution in mind. Share it with us!